Many users of Bandhan subscribe to weekly alerts features. Our users receive weekly mails for new matches that meet their search criteria. 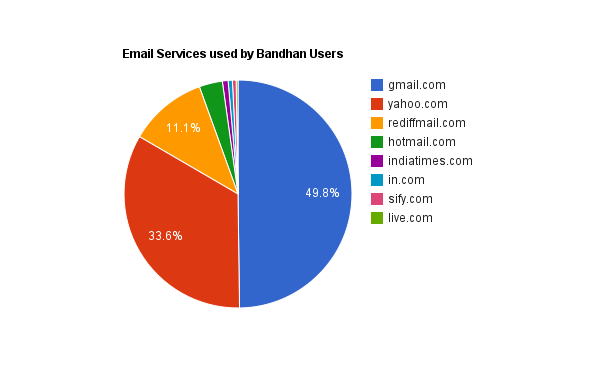 Out of curiosity, we did some analysis of email services used by our users. This data is generated from few tens of thousands of our users. It is tad surprising to see Gmail leading with 50%. Yahoo is next with 34% share and Rediff with 11% share. Together, the top 3 service account for a massive 95% share. Facebook has announced messaging service. Probably, all the Facebook users will have their own @facebook.com email address soon. With more than 500 million users, it would be interesting to see how Facebook affects email services.